These adorable, camping themed touch dot math addition cards provide FUN and ENGAGING practice for your students learning how to add! 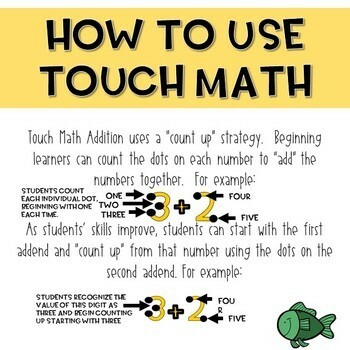 Included in this file are addition cards and answer cards for all addition facts 1-9, teacher directions and an explanation of how to use Touch Dots for addition! 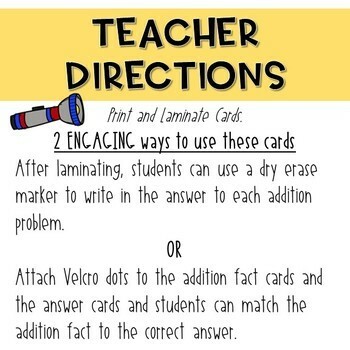 Attach Velcro dots to these cards and use as a matching game or laminate the cards and let students write the sum in the box on each card with dry erase markers! These are perfect for math centers, early finishers, intervention or reteaching. There are so many possibilities! Check out the preview for a closer look.